Due to inclement weather, the Civic Center will be closing this evening. We have rescheduled the meeting to this Tuesday, April 23, 2019. Same time, same place. 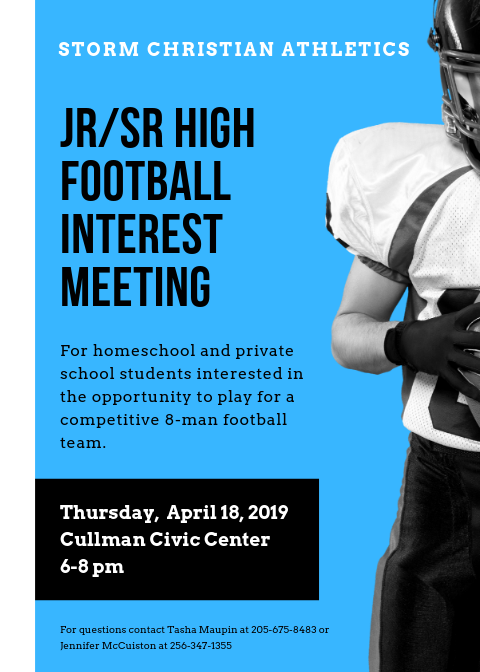 We had 9 guys show up for the football interest meeting Tuesday night. They would like to have 15-20 guys. If you are interested in this opportunity, please call Tasha or Jennifer McCuiston. Their numbers are listed at the bottom of the flyer. If this makes, this would be the beginning of an athletic program that could include basketball, baseball, softball and cheer. Please pass this information along to anyone you know who might be interested.